The Seamaster Cosmic is a vintage watch with many faces. 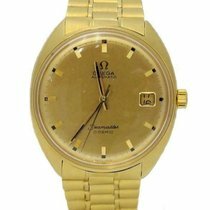 Omega produced these timepieces from 1966 to 1980. With their simple designs and moderate prices, they make the perfect entry point into the world of Omega. Omega has been producing the Seamaster series since 1948. This Swiss luxury watch manufacturer has no other current collection with such a long history. The Cosmic models, first introduced in 1966, were an important episode in the Seamaster's history. They proved that the Seamaster could be more than just a pure diving watch. Some Cosmic models look like sporty dress watches, especially those with gold cases. Others have designs that resemble a "real" diving watch. The Seamaster Cosmic collection is diverse. One feature that all Cosmic models share is their simple dial design characterized by line indices and thin baton hands. Cases ranging from oval to barrel-shaped surround these round dials. There are versions available in stainless steel, solid yellow gold, or with gold plating. 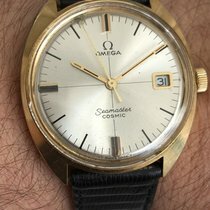 Omega initially used unishell cases with fixed case backs for the Seamaster Cosmic. This meant the watch could only be serviced from the front and had a maximum water resistance of 30 m (3 bar, 98 ft). The Cosmic 2000 line saw the introduction of a two-piece case. The movement of these models sits inside an extra case that is fixed to the outer case using an o-ring. In turn, the glass and case back are fitted into the case. This construction not only makes repairs easier, but also increases the water resistance to 60 m (6 bar, 197 ft). As a vintage watch from the 60s and 70s, it's no surprise that the Seamaster Cosmic feels small by modern standards. Some models are only 33 mm in diameter, though most measure 35 mm across. The Cosmic 2000 "Jumbo" from the mid-70s was a bit larger at 38 mm. Each watch is powered by a manual or automatic caliber, some with a date or day-date function. How much does a Seamaster Cosmic cost? If you're a fan of vintage watches, the Omega Seamaster Cosmic is a good choice for you. This watch is over 40 years old and has a good reputation. You can tell it's a bit older by its design, although it doesn't come off as old-fashioned or antiquated. Rather, it has a refined, stylish look and fits well in the modern world. It is better suited for smaller wrists. Most of the early models were outfitted with one of two manual calibers: the 601 or the 613. Omega introduced automatic movements to later generations, including the calibers 552, 562, 565, and 752. Watches with manual calibers are priced particularly well. You can purchase a well-maintained stainless steel model without a date for as little as 530 USD. An automatic timepiece with a date and gold-plated case comes in at an equally moderate 670 USD. You'll have to dig a bit deeper in your pockets if you prefer the Cosmic with an 18-karat yellow gold case. Plan to spend between 1,000 and 1,300 USD for one of these watches. 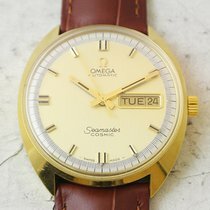 Omega introduced another watch to the Seamaster Cosmic series in 1972: the Cosmic 2000 . It had a larger case (38 mm), which still appears sizeable today. The 2000 is considered quite robust; when in good working condition, it is water resistant to 60 m (6 bar, 197 ft). The Cosmic 2000 is often powered by the caliber 1012, an automatic movement with a date display, 23 jewels, and a frequency of 28,800 alternations per hour (4 Hz). Another frequently used movement is the 1022, which has a day of the week display in addition to a date display. Expect to pay around 980 EUR for a stainless steel Cosmic 2000 in good condition. Gold-plated models cost 170 USD more on average. There are also 39-mm versions of the Cosmic 2000 available. These are designed to look like classic diving watches. They have a rotatable bezel, a necessary and classic safety feature of diving watches. The bezel allows you to read how much time you've spent underwater. However, despite its looks, this version of the Cosmic 2000 has the same water resistance as the other watches in the 2000 series: 60 m (6 bar, 197 ft). The edition with a date demands around 2,100 USD in good condition. Watches with a day display in addition to the date come in at about 2,300 USD. Where does the name 'Seamaster Cosmic' come from? Naming a watch from the Seamaster series 'Cosmic' may seem a bit strange today, but at the time, space flight was at its peak. The Soviet Union sent a human into space for the first time in 1961. When the Seamaster Cosmic was introduced in 1966, the USA was in the midst of their Apollo program with the goal of landing on the Moon. The public excitedly followed these technological advances. From a marketing standpoint, it was a logical move to name a new model after this exciting time in space exploration. If you want to use your Seamaster Cosmic as a diving watch, you should proceed with caution. When it was brand new, the Cosmic 2000 was water resistant to 60 meters (197 ft). However, decades later, it's risky to simply wear the watch while swimming or diving without having it checked. If you want to take it underwater, you should have its gaskets changed and its water resistance tested by a watchmaker. 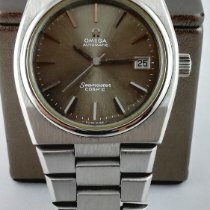 The Seamaster Cosmic was produced until 1980. Towards the end of its production, it suffered due to the Quartz Crisis. At the time, mechanical watches didn't seem to have a future. 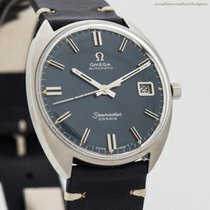 However, as vintage watches, they are affordable entry points into the world of Omega.